Plastic grip seal bag containing 6 crosshead screws (four 4.5 cm and two 3 cm), 6 washers and the drive band. Fix one foot to one side of the base of the frame by pushing the cut-out onto the correct rear corner of the frame and then screwing two of the longer screws with washers through the holes provided. Then attach the other foot in the same manner. Push the head assembly onto the main frame so that the flyer assembly faces to the same side as the drive wheel and then attach it with the two shorter screws through the holes on the opposite side to the bobbin and wheel. The last step is to fit the drive band. Drape the drive band over one of the smaller pulleys on the flyer assembly and onto the drive wheel. Then gently pull on the spring-loaded treadles so that they are pulled away from the wheel. Holding the treadle assembly in that position with one hand, thread the drive band between wheel and treadle assembly. Release pressure on the treadles so that the assembly returns to its original position next to the wheel but make sure that the drive mechanism is seated into the wooden slot on the back of the treadle assembly. 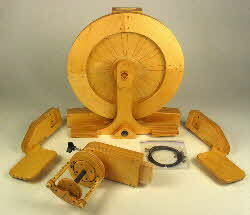 If necessary, pull out the treadle assembly again to properly seat the mechanism in the slot. Then feed the drive band around the drive wheel and ensure that it turns the flyer assembly freely when the wheel rotates. Your SpinOlution Echo spinning wheel is now ready for you to use.